This is Chandra's X-ray view of the so-called Cloverleaf quasar, a single object whose image has been reproduced four times through an effect known as "gravitational lensing." This process occurs when the gravitational field of a massive, intervening object bends and magnifies light from a distant quasar to produce the multiple images. The foreground galaxies in this case are too faint to be seen in these images. One of the images in the Cloverleaf is brighter than the others in both optical and X-ray light. This is due to "microlensing," where a single or binary star in one of the intervening galaxies passes directly in front of the small, X-ray producing region around the quasar's supermassive black hole. X-ray microlensing gives astronomers a new and extremely precise probe of the gas flow around the supermassive black hole. This optical image of the Cloverleaf quasar was taken with the Hubble Space Telescope as part of the CfA-Arizona Space Telescope Lens Survey. The position of the images in the X-ray sources align very well with Hubble pictures. A comparison of the X-ray and optical images also shows that image "A" is much brighter in X-rays (see image #1, above) than optical light. This is due to an effect called gravitational microlensing, wherein a star or binary star system in one of the intervening galaxies passes directly in front of the small, X-ray producing region around the quasars supermassive black hole. The optical light comes from a much larger region, so it is not magnified by the passing star or stars. This illustration depicts a massive black hole like the one at the center of the Cloverleaf quasar. Around it is a swirling disk of gas, which gradually pours down into the black hole. As the gas falls inward, it heats up and glows brightly, getting hotter and hotter the closer it is to the event horizon. Some of the gas is blown away from the disk like steam from a kettle. 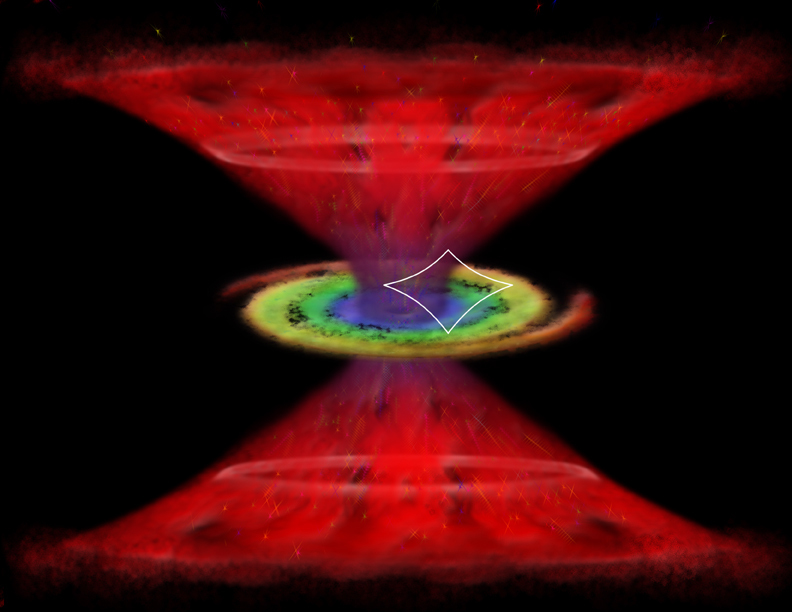 As this gas streams off the disk, the intense radiation generated by the very hot gas near the event horizon forces the escaping gas into a cone and accelerates it to speeds as high as a tenth the speed of light. The effect of X-ray microlensing, as detected by the latest Chandra results, gives astronomers a new and extremely precise probe of the gas flow around the supermassive black hole. The area around the black hole that astronomers believed is magnified is marked by the diamond region. 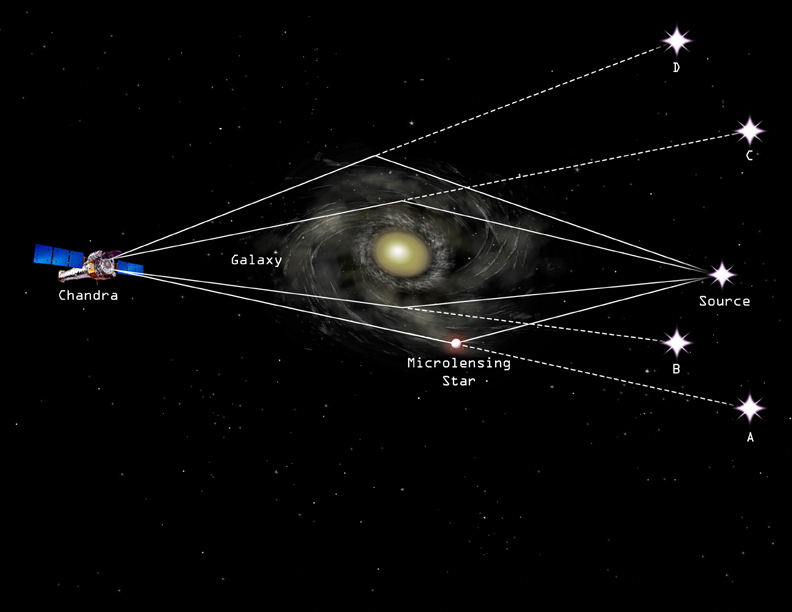 Single cosmic objects may appear as multiple images to astronomers through a process known as gravitational lensing. 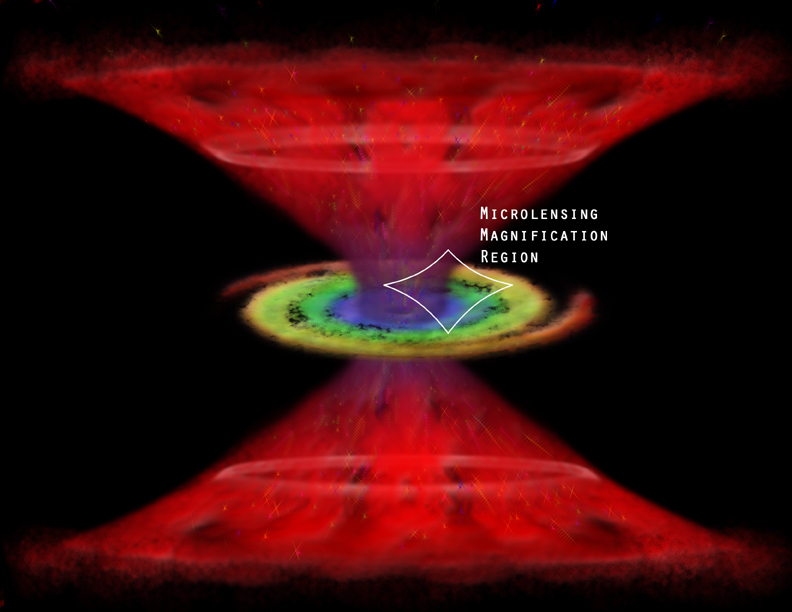 This effect occurs when the gravitational field of one or more foreground galaxies bends and magnifies light from a much more distant object to produce multiple images, as shown in the artist's rendering. In the case of the Cloverleaf quasar, Chandra's X-ray view found four separate images of this single object that is 11 billion light years away.